US Ambassador to the United Nations Nikki Haley says the world community appreciates Trump's 'blunt, honest' approach to North Korea and Iran. WASHINGTON (Sputnik) — The United States will continue to pursue the responsible path of diplomacy on North Korea, despite President Donald Trump's warning that Washington was ready to destroy the country, US Ambassador to the United Nations Nikki Haley said on Wednesday. "What we are saying is we have exhausted every diplomatic means and we are going to continue to do that. While he is being responsible we're going to be responsible," Haley said during an interview with ABC's Good Morning America. The US ambassador argued that world leaders appreciated Trump's stern warning to North Korea. 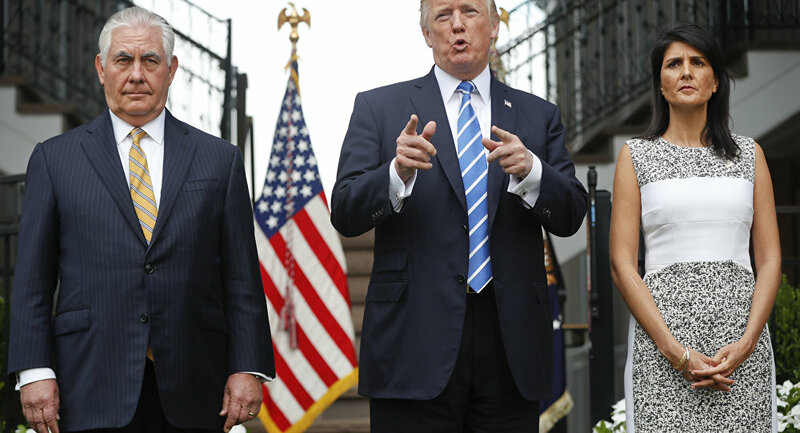 "The international community actually appreciated the blunt, honest approach that the president took on North Korea, as well as on Iran," Haley said. In his first address to the UN General Assembly on Tuesday, Trump threatened to "totally destroy" North Korea if forced to defend the United States or its allies. The US president claimed that Pyongyang's "reckless pursuit of nuclear weapons and ballistic missiles" "threatens the entire world with the unthinkable loss of human lives" and said that "if the US is forced to defend itself and its allies [Washington] will have no choice but to totally destroy North Korea." After praising Russia and China for approving the latest round of anti-North Korean sanctions, Trump called upon nations to "isolate the Kim regime until it ceases its hostile behavior" labeling the country's leader as a "Rocket Man on a suicide mission."